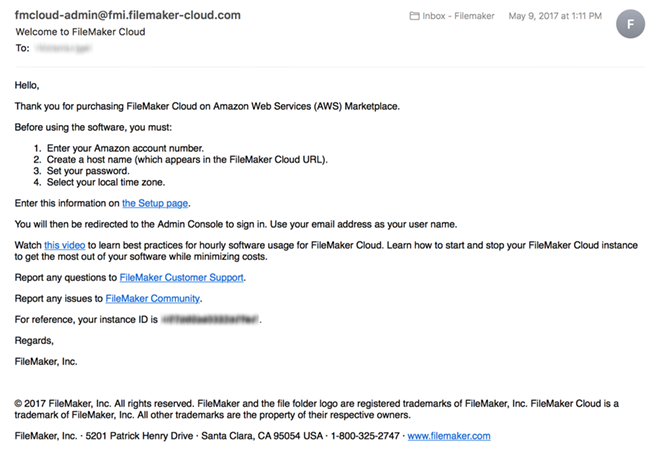 You must have an Amazon Web Services (AWS) account before you create a FileMaker Cloud instance on AWS. To purchase a new FileMaker Cloud license, determine the number of User Connections client connections you need. You can choose from SKUs with 5, 10, 25, and 100 user connections. Note:For SKUs with 25 or fewer User Connections clients, the maximum number of supported FileMaker Perform Script on Server (PSoS) sessions is 25. For SKUs with greater than 25 User Connections clients, the maximum is 100. To use an existing FileMaker Server license, or if the number of User Connections client connections you need differs from the AWS SKUs, choose FileMaker Cloud BYOL. After the trial period, your subscription converts to a paid hourly subscription. To change to a BYOL or an annual subscription, first discontinue the hourly subscription (see FileMaker Cloud Help) and then purchase the new subscription. The resources in each region are independent. For example, if you create FileMaker Cloud instances in US West and US East, the two instances are independent. When you sign in to the AWS Elastic Compute Cloud (EC2) console, you choose a region from the list next to your user name in the navigation bar. To reduce data latency, choose the region nearest you. Note:Key pairs are region specific. When you create the key pair, it is valid only for the region selected upon sign-in. Sign in to the EC2 Management Console. If a region isn't already selected, select one from the top navigation bar. In the left navigation pane, under Network and Security, choose Key Pairs. In the Create Key Pair dialog box, name your key pair and click Create. The key pair is downloaded by your browser to your computer. If the extension .txt is added, delete that extension so that the key pair filename ends in .pem. Note:You might have to sign in again to AWS Marketplace. If so, click Sign in at the top of the page. Click the SKU you want to purchase. Click Continue on the FileMaker Cloud homepage. Click Accept Software Terms on the next page. On the Next Steps page, click Return to Product Page. Review the Software Pricing information and choose the hourly or annual subscription term. Note:Hourly subscriptions incur charges whenever your FileMaker Cloud instance is running. Click Usage Instructions to display instructions and links necessary for creating your instance. On the Usage Instructions page, click the link for a regional cloud template. Choose the link for the region nearest you. If you previously created a key pair, choose the same region as before. The Create Stack wizard guides you through the four steps to create an instance. On the Select Template page, click Next to use the stack template URL selected at the bottom of the screen. This URL determines the properties of the cloud stack that will be created. On the Specify Details page, enter the following and then click Next. A stack name. This name identifies your stack in AWS. It can contain only letters, numbers, and dashes. An email address for logging in to FileMaker Cloud. This email address will be the root administrator user name. The key name of your key pair. Review your settings, acknowledge possible Identity and Access Management (IAM) resource creation, and click Create. The CloudFormation Management Console screen appears. If you have not created stacks before, no stacks are listed. You can check on your stack by clicking the Refresh button at the top right of the list. The stack status is CREATE_IN_PROGRESS. Wait several minutes while the stack is created. The status changes to CREATE_COMPLETE when the process is finished. Monitoring stack creation on the Events tab for your instance in the CloudFormation Management Console is good practice. You can add a CloudFormation shortcut (and other services, such as EC2) to the AWS Services navigation bar by clicking the pushpin icon in the navigation bar and dragging the CloudFormation service there. If the stack detects an internal failure during creation, the cloud formation template terminates the stack, and the Cloud Formation Console displays a failure message. If the stack creation is successful, the console displays a success message. If the stack times out, its creation is rolled back and the console displays a "wait condition" message. The default wait time is 15 minutes, and the timer starts after the instance is created. If you did not select a BYOL license, skip to step 2. If you selected a BYOL license, you receive an email with a link to the FileMaker Store, sent to the email address specified when you created the instance. After the FileMaker Store completes your transaction, you receive the email shown in the next step. Wait to receive an email from the FileMaker Cloud administrator, sent to the address specified when you created the instance. Note:If you plan to use a custom signed SSL certificate instead of the default Comodo certificate, copy and save the URL that appears in the browser when you click the here link in the email. You will need the generated host name for Domain Name Service (DNS) mapping when you import the custom certificate. Amazon Account Number: Your Amazon account number. To locate it on the AWS Management Console, click Support, choose Support Center, and view your 12-digit account number at the upper right. Host Name: Create a host name for FileMaker Cloud. This name appears in the server URL, and cannot exceed 40 characters. Password: Create a password. The password must have from 8 to 128 characters and include 3 of these 4 character types: uppercase letter, lowercase letter, number, and symbol. Confirm Password: Confirm the password you created. Local Time Zone: Choose your local time zone from the list. The Admin Console Setup page appears, displaying a countdown timer and a wait message. Sign in when the Admin Console Sign In page appears. Your name is the email address you specified when you created the instance. 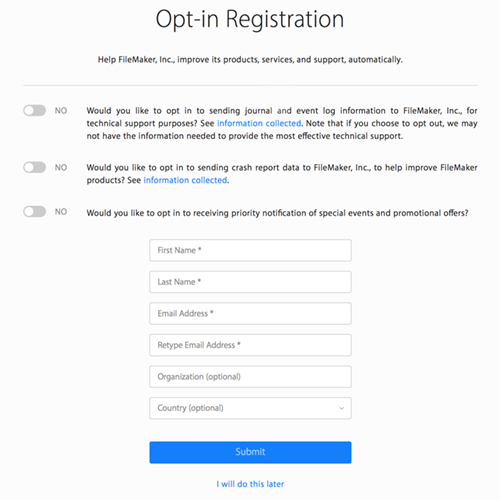 In the FileMaker Cloud Opt-in Registration page, enter your information and click Submit. Or, click I will do this later at the bottom of the page. If you choose to register later, go to the Opt-in Registration area in Subscription > Subscription Center to complete registration. 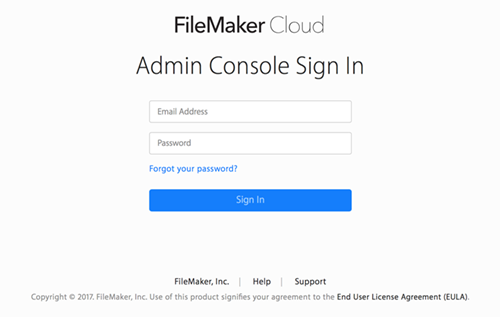 For information on using FileMaker Cloud Admin Console, see FileMaker Cloud Help. 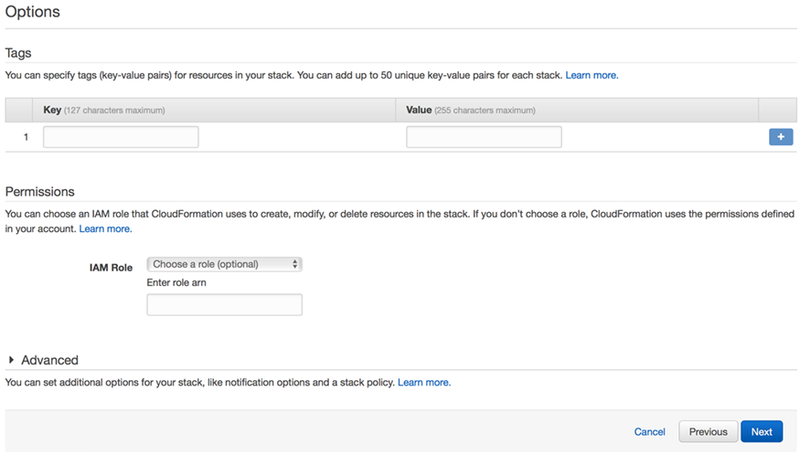 Once the stack creation is complete, charges for your instance begin accruing on AWS. BYOL users may have to wait as long as a day for the FileMaker Store to validate their license. During any wait time, they will accrue AWS charges before receipt of the welcome email. 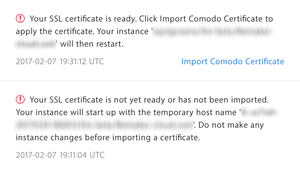 During FileMaker Cloud setup, FileMaker provides a default Secure Socket Layer (SSL) certificate issued by the Comodo certificate authority (CA). Comodo reviews your requested host name and assigns the SSL certificate to your fully qualified domain name (FQDN). Enter your username and password, and click Sign In. You see a notification that the associated SSL certificate is not yet available and the temporary host name has been assigned. You can work with FileMaker databases while you wait, but do not make any changes to your FileMaker Cloud instance. 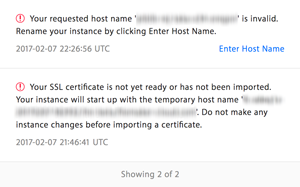 When the SSL certificate for your host name is ready, a second notification appears. Click Import Comodo Certificate. In the confirmation dialog box, click Import and Restart. A wait page appears, displaying the URL with your requested host name. Write down the URL in case you need to troubleshoot. You receive an email when your instance with the requested host name is ready. Click the URL in the email to sign in. A delay in host name processing might mean that your host name will be rejected by Comodo. For example, if your host name includes an established company or website name, it can be rejected. Click Enter Host Name in the notification. In the host name dialog box, enter a new host name and click Request Name. A message confirms the host name request. When the host name and SSL certificate have been successfully processed, a second notification appears. Click Import Comodo Certificate. A wait page appears, displaying the URL with the new host name. Write down the URL in case you need to troubleshoot. You receive an email when your instance with the new host name is ready. Click the URL in the email to sign in. Review the AWS EC2 Instance types to choose the instance type that best suits your needs. See the following summary table, or see Amazon EC2 instance types. 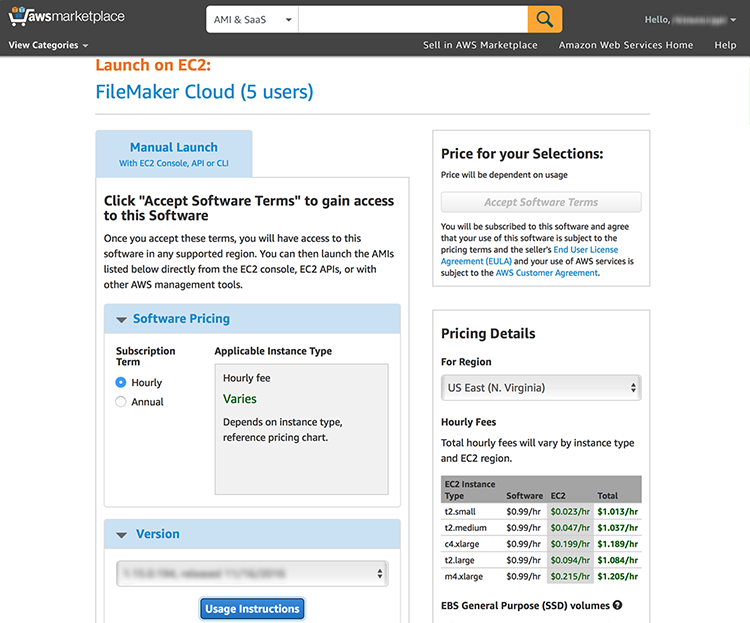 Review the pricing details for your instance type on the FileMaker Cloud homepage. See Amazon EC2 pricing. Important: Your FileMaker Cloud instance is a compute resource in AWS. If you have an hourly subscription, you pay on an hourly basis from the time you launch or start a compute resource until the time you stop or terminate it. (For data storage and transfer, you pay on a per gigabyte basis.) You can turn off your compute resources and stop paying for them when you don’t need them. See AWS EC2 User Guide, "Stop and Start your Instance". This table summarizes the instance types supported for FileMaker Cloud. For each type, storage is Amazon Elastic Block Storage (EBS), a durable block-level storage volume attached to a single EC2 instance. For optimal operation, FileMaker Cloud requires 40 GB of storage. Each instance will include 40 GB of EBS. You can upgrade the volume size at additional cost. This section describes AWS security features and the steps you can take as the root administrator to apply these security features to your FileMaker Cloud instance. 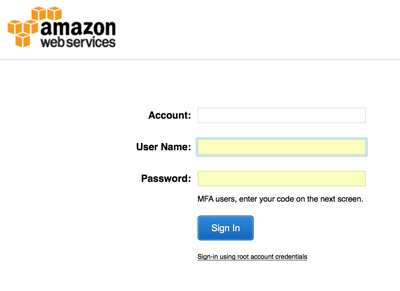 Root credentials: Secure your root AWS account credentials by setting up multi-factor authentication (MFA), to require more than one method of authentication. See Using Multi-Factor Authentication in AWS. 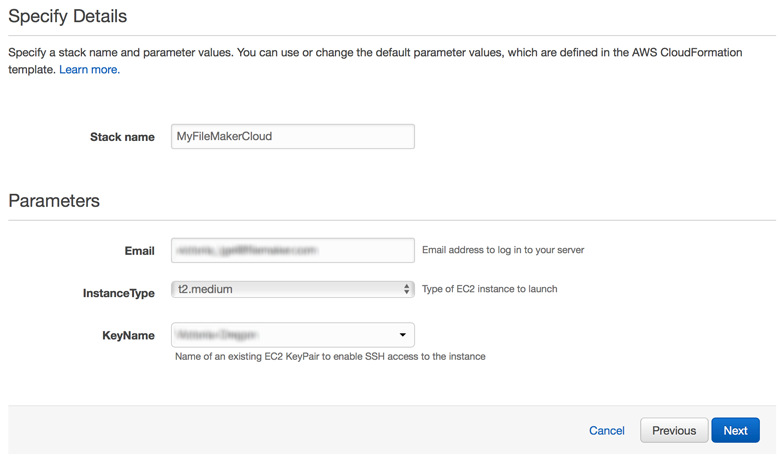 You created an EC2 key pair used to launch your FileMaker Cloud instance and to provide Secure Shell (SSH) access. Amazon EC2 stores the public key only, and you store the private key. Anyone who possesses your private key can decrypt your login information, so it's important that you store your private keys in a secure place. For increased security, instead of using Amazon EC2 to create your key pair, you can create an RSA key pair using a third-party tool and import the public key into Amazon EC2. For example, use ssh-keygen (provided with the standard OpenSSH installation) to create a key pair and protect your key pair with a passphrase. When prompted, enter and reenter a passphrase. The key pair is generated, as shown in a series of messages. Import the public key: in the AWS Management Console, under Network and Security, choose Key Pairs and click the Import Key Pair tab. In the Import Key Pair dialog box, browse to the public key file location, or use the cat command to copy and paste the public key. Enter yes when prompted to connect. Enter the passphrase in the dialog box, and click OK.
AWS Simple Email Service (SES): FileMaker Cloud uses AWS SES for sending emails to administrators. Security is enhanced because you don't have to set up an SMTP server and open port 25. AWS Web Application Firewall (WAF): Consider purchasing AWS WAF, a web application firewall that can help protect FileMaker Cloud against web security risks. With AWS WAF, you first identify the Amazon CloudFront web distribution to protect, and then create and deploy the rules and filters that will best protect your instance. See AWS WAF Product Details. Control network access to your EC2 instance through the security group, which acts like a built-in software firewall for your instance. The security group allows you to filter both inbound and outbound traffic. FileMaker Cloud doesn't filter outbound traffic because each customer's users will be unique. However, if you have a known set of outbound ports, you can configure them for your instance's security. For Secure Shell (SSH) access, open port 22. For access by ODBC or JDBC clients, open port 2399. In the AWS Management Console, select your instance. On the Description tab, click the Security groups link. In the Edit inbound rules dialog box, click Add Rule. For each port, specify the port type, number, source, and IP address or range in CIDR notation. For SSH access, choose SSH. Port 22 appears as the number. Choose Custom and enter the IP address or range. For ODBC or JDBC client access, choose Custom TCP Rule and enter port 2399. Choose Custom and enter the IP address or range. Note:Click the i button for information on accepted values for any column. FileMaker, Inc., recommends restricting inbound traffic for the remaining ports 80, 443, and 5003. Avoid inbound access from Anywhere. For secure access from an ODBC or JDBC client, use a Virtual Private Network (VPN) to connect the client to FileMaker Cloud. Make sure to protect the SSH key pair with a passphrase to limit access to your instance. See Protecting your key pair. Denial of service attack prevention: FileMaker Cloud implements rules for rate control. If ports 80, 443, or 2399 receive greater than 20 hits per second from the same incoming IP address, subsequent hits are dropped. This section describes FileMaker Cloud security features and the steps you can take as the root administrator to manage these features in your FileMaker Cloud instance. Software patching: You receive notifications when patches are available. Non-root credentials: FileMaker Cloud requires that you set up Login with Amazon, an identity provider based on OAuth 2.0. 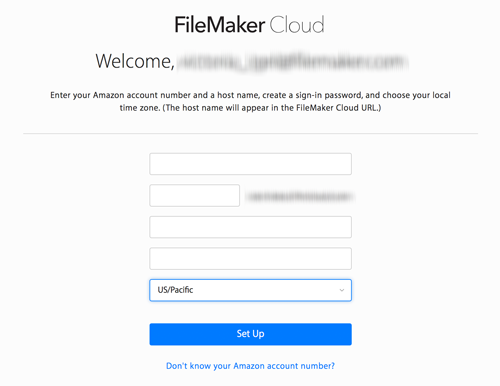 This feature allows authenticated users to sign in to FileMaker Cloud with their Amazon credentials. 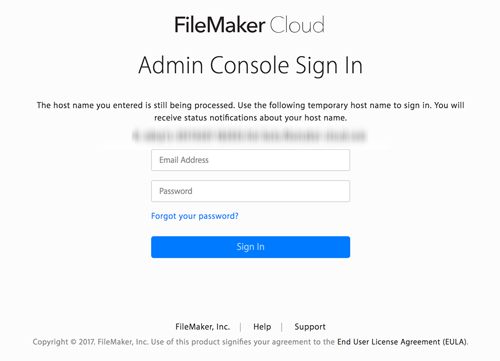 These users have limited access to FileMaker Cloud; for example, they cannot see the configuration page, where the root user can change their email address or password. Database encryption: FileMaker Cloud encrypts all the information stored in a database file (also known as Encryption at Rest) before opening it. You are required to create an encryption password for the database, and have the option of saving the password and creating a hint for it. Session timeouts: Set session timeouts for FileMaker Go and FileMaker Pro clients. The default session timeout for FileMaker WebDirect users is 15 minutes. When client users' idle periods reach the timeout setting, they are disconnected. Setting session timeouts reduces the risk of database files being accessed by an unattended computer or mobile device. FileMaker Cloud plug-ins: Use plug-ins only from trusted sources. Plug-ins can access and modify your solution and connect to other services over the Internet. If you enable FileMaker Script Engine (FMSE) plug-ins, you can choose whether to allow scripts to install, update, and load plug-ins using the Install Plug-In File script step. Similarly, if you allow FileMaker WebDirect plug-ins, you can choose whether to allow the Install Plug-In File script step in FileMaker Web Direct. Log file entries: Frequently, download and review the Event.log file for the keyword SECURITY to see security-related entries. FMSE cannot query the AWS metadata service. FMSE cannot send requests to localhost at ports 1895 and 16002. FMSE cannot execute applications from the Data folder, and it can access only the Data/Documents and Data/Database folders. The following terms appear during purchase or stack creation. For detailed descriptions, see the AWS documentation. Amazon Elastic Blockstore (Amazon EBS) – Block-level storage volumes for use with Amazon EC2 instances. Amazon Elastic Compute Cloud (Amazon EC2) – Scalable computing capacity in the AWS cloud. Amazon Machine Image (AMI) – A preconfigured template for instance creation. Amazon Simple Storage Service (Amazon S3) – Storage for the Internet, used to store and retrieve any amount of data at any time, from anywhere on the web. BYOL – Bring Your Own License. A license model that lets you use an existing software license for a cloud instance. Identity and Access Management (IAM) – A web service that lets you control access to AWS resources for your users. Instance – A virtual computing environment. Instance type – A preset configuration of CPU, memory, storage, and networking capacity. Key pair – Provides secure login information for your instances. AWS stores the public key, and you store the private key in a secure place. SKU – Stockkeeping unit. An identification, usually alphanumeric, of a specific product that allows it to be tracked for inventory purposes. Snapshot – A backup of your volumes that is stored in Amazon S3. Use these snapshots as the starting point for new Amazon EBS volumes or to protect your data for long-term durability. Stack – A group of related resources that you manage as a named unit. Switchover – For FileMaker Cloud, an instance switchover occurs when the administrator initiates a change that produces a fresh copy of the instance. These actions trigger an instance switchover: version upgrade, instance refresh, and instance type or storage volume upgrade. 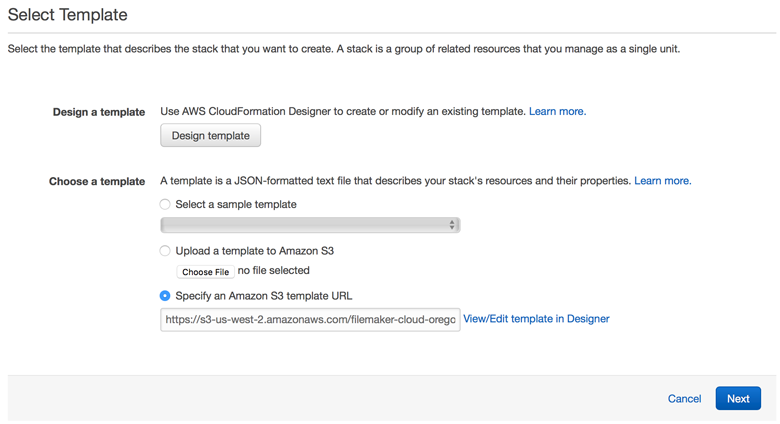 Tag – Metadata that you create and assign to your Amazon EC2 resources. Tags are case-sensitive key-value pairs that help you manage your instances. For example, you could define a tag with Key = Name and Value = OregonServer. Template – An AWS CloudFormation template is a formatted text file that describes the resources to be provisioned in your AWS CloudFormation stacks. Timeout – Sets the number of minutes before stack creation times out. The default is 15 minutes for initial stack creation and 60 minutes for upgraded stacks. © 2016–2017 FileMaker, Inc. All Rights Reserved.